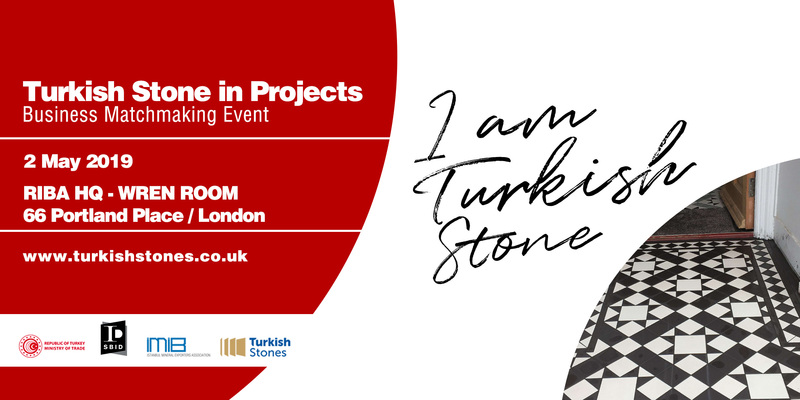 This event brings 14 Turkish Stone companies and British architecture, design and construction industry together. The participants will be able to have one-to-one meetings with Turkish natural stone project installation companies that can supply the natural stones you may need in all building and design projects and exchange information with all participants. The event is a part of a trade delegation which is sponsored by the Republic of Turkey Ministry of Trade and organised by Istanbul Mineral Exporters’ Association (IMIB) with the Society of British and International Design (SBID). Attendance is complimentary for Architects, Interior Designers, Contractors, Furniture Designers, Stone Consultants, Trade Associations and Chambers and includes a networking lunch and B2B meetings with Turkish suppliers. Canvass the varied palette of Turkish Stone from 14 natural stone installation and supply companies, for use in all types of work – flooring, cladding, hard landscaping, kitchens, bathrooms, roofing, fireplaces, memorials and sculpture. The materials to be exhibited consists of marble, granite, limestone, onyx and travertine. The event presents an excellent opportunity to enhance your knowledge about Turkish natural stone industry, form business-relationships and collaborate with professionals.